Shredded cabbage, carrot and onion in a mayonnaise dressing. Creamy and Crunchy. Prepared with fresh cabbage, carrot and onion. 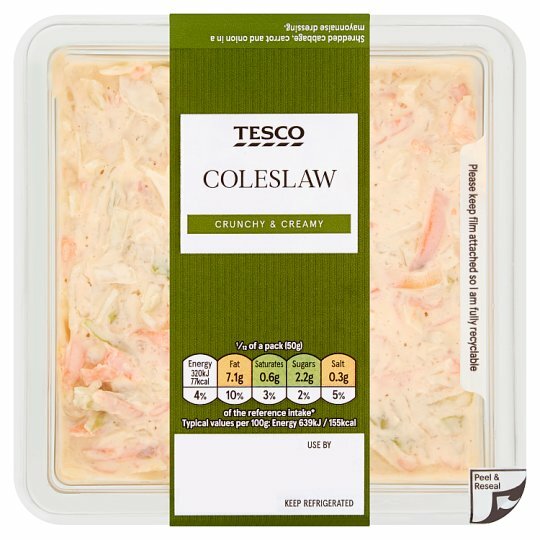 INGREDIENTS: Cabbage (47%), Rapeseed Oil, Carrot (16%), Water, Double Cream (Milk), Sugar, Pasteurised Egg Yolk, Spirit Vinegar, Salt, Onion, Stabilisers (Guar Gum, Xanthan Gum, Pectin), Mustard Seed.